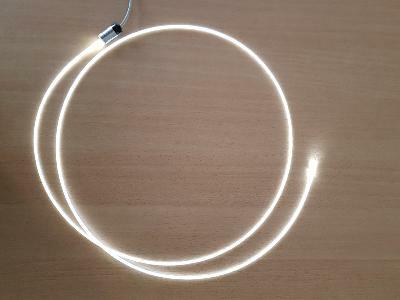 Luxeri provides a wide range of flexible light diffusing guides that highlight a contour along its entire length, such as bendy neon. This one consists of a bundle of side diffusion optical fibers conditioned to have a perfect homogeneity of diffusion over a given length. The side diffusion fibers consist of a PMMA core and a fluorinated polymer cladding with an aperture of 0.5. Several grades of fibers and polymers can be used to meet temperature requirements,fire standards and mechanical stresses. Several optical diameters are available. The light diffusion between the two ends of the bundle is perfectly homogeneous.